This myth leaves me stunned because I believe its falsehood is obvious. I’ve had the privilege to work with people in need for over twenty years. Sadly, in all of that time, I have never known a homeless person who was able to eat three healthy meals a day. Really. As we all know, obesity is an American epidemic. Whether we are housed or homeless, many authorities agree that our diet of high-calorie, unhealthy foods contributes to our obesity. It would appear that many housed people are neither utilizing their kitchens to prepare nutritious foods, nor making healthy food choices at restaurants. Homeless people may have similar nutritional challenges, but for different reasons. On May 25, 2012, the San Diego County Regional Task Force on the Homeless reported in “A Point-In-Time Assessment of Homelessness In San Diego County – 2012,” that there are a total of 9,641 homeless people within the county. Of this total, 4,374 homeless people are sheltered and often receive their meals from their residential facilities. However, there are at least 5,267 homeless people who are unsheltered and generally live without their own cooking facilities. Unsheltered homeless people generally eat prepared food that they get from Good Samaritans, at group food service opportunities and, when they have money, from fast food restaurants and/or grocery stores. Pasta, bread and pastries are in abundance. Organic foods as well as raw fruits and vegetables are seldom available. Without healthful foods to eat, homeless people have very few chances of avoiding obesity. I’m grateful to the following homeless people and service provider for sharing whether they feel that homeless people have too much food to eat. “I don’t think that homeless people have too much food. We need more fresh veggies, not canned. But that’s not easy to get. “Our goal is to feed the hungry, tend to the sick, visit prisoners and clothe the naked.” We feed the hungry… We fulfill the great commission to share the good news by doing the four things I’ve said to serve the God of love. “Homeless people don’t have enough food. 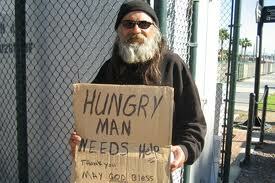 I believe that homeless people don’t have proper nutrition because they can’t cook. Without cooking facilities, it is difficult to get proper nutrition. Proper nutrition promotes good mental health and the ability to make good decisions. “I believe that there are also people with roofs that don’t have enough food. “Because I have celiac sprue disease, I cannot eat anything that has gluten grains in it – wheat, rye, oats, barley, spelt. And I’m dairy intolerant… Consequently, most of my money goes to food and dietary supplements. “Although I have a very limited income, I still feel that it is important to give food to others who need it. Because I’m aware of the need for healthy food and because I’m aware of how little healthy food there is ‘out there,’ I cook and prepare my meals. Because it is hard to make food for one person, I prepare a lot of food and share it with people who need food. Many homeless people who come to me are vegetarians or need healthy food. So, they are very happy to have this food. “It’s hard to remember all of this. If you don’t know where these meals are, it’s difficult. And just to get to some of these places is an effort without a bus pass. It can take an hour to get to a scheduled meal. “Sometimes you have to stand in line for hours before a meal, after which there is a religious service for an hour or two and then you get to eat. That means it could take a total of 4 to 5 hours out of your day before you can get a meal indoors. The Lutheran Church serves a meal. Father Joe [St. Vincent de Paul] serves lunch. God’s Extended Hand serves dinner. The Salvation Army serves dinner. The Horizon Church serves dinner. Father Joe [St. Vincent de Paul] serves brunch. Presbyterian Soup Ladle serves a meal. That there are housed ppl who believe homeless have “too much to eat” isn’t all that surprising. It is an axiom in contemporary American society (thanks to advertisers ) to equate being thin with starvation and conversely, being fat with gluttony, neither of which is true. It’s all in the quality (or lack thereof) of the food you consume. You may be thin, but that quality does not necessarily make you healthy. And there are “fat” ppl who are a lot healthier than their thinner counterparts simply in terms of nutrition. But most will never reach this realization simply because it’s part & parcel of the reason why Americans are obese in the first place. Our entire food supply has been hijacked by industry poisoning our food with high fructose corn syrup and GMOs. If you’ve been paying any attention at all, the USDA/FDA has been complicit in permitting this to happen. Just read any installment of Natural News and/or the The Cornucopia Institute. Food is a major battleground in the U.S.
Further, it is a fact that ppl who have to rely on church food pantries and such to eat rarely see fresh produce or organic whole grains. The food that is donated is predominantly canned and processed foods. If you see anything fresh at all it is donated white bread and buns leftover from someone’s holiday BBQ. But this isn’t going to register with housed ppl who are under the impression homeless are overfed because the bottom line is: they don’t know, but more significantly, they don’t *want* to know. Homeless is too much like being unemployed, and, in my experience, most ppl don’t want anything to with either so they avoid those who are either. And your comment is right-on! How do you know so much about homelessness? Please share, if you feel like it. I was really shocked to hear this myth espoused by someone who could have known better. And I’m so glad that you bring up the quality of the food determines whether a person is healthy or not. Often, poor quality of food leads to obesity. Homelessness is a raging epidemic in American society. One only need open ones eyes to see the reality. But all too often, ppl are far too self-absorbed to see anything they don’t want to, especially if they have a full-time, permanent job. I was guilty of the same selective blindness until I lost mine. The continuing horrific economy has rendered half of the working population in the U.S. either under or unemployed, which is why food pantries & such are absolutely exploding with demand. The happy, shiny, sanitized unemployment rate as massaged by the BLS is a joke. Wall Street is booming and Main Street is starving and homeless. Although I am housed for the moment, I am not a stranger to having to utilize donated food because unemployment (which just ran out for me) does not cover rent + bills + food. I don’t even have a motor vehicle anymore because it was smashed last summer by a red light runner and I can’t afford to buy another car. Suffice it to say, I have also become an authority on public transport and biking. As the economy continues to crumble, more and more highly educated and experienced, formerly middle class ppl like myself will fall into poverty. There does not seem to be a voice for this fastest growing sector of the general population just like there has never been a voice for the homeless who have been, traditionally, up until the past few years, almost always the mentally ill. When poverty & hunger becomes your life, you tend to notice. Thanks Boyo, I notice too. I appreciate you noticing; many people can’t or aren’t or don’t want to notice. Can you share something about how you have such clarity on this issue? I’d like to address that because I agree with you wholeheartedly. However, a lot of the recent Point In Time Counts required by HUD are indicating that homeelssness in major cities, such as Los Angeles, New York and others, is decreasing! How can this be? I’ve spoken to the Los Angeles Homeless Services Authority (LAHSA) group in LA about this and they’ve told me that their numbers are correct. They say that people are being housed and therefore there are fewer homeless people in their city. That’s not what I see when I look around? What do you see? Thanks for this! Real insight into our homeless population and how poverty grips our country. A lifelong volunteer feeding our homeless brothers and sisters, most everything cited describes reality. Regarding mental illness, a large portion of those enduring homelessness and isolation suffer in unseen ways. Living on the street in isolation, along with poor diet, lack of sleep, etc., this is often what causes much of the illness which can be observed by passersby. The cycle is clear, losing their job, home and family, results in extreme isolation, etc. The downward spiral is very difficult to reverse, adding to the mental instability. It depends where you live. For example, certain cities only have Food Stamps servicesr ( once a month, disclaimer: people don`t eat just once a month. ).